Stage 7 specializes in the excellence of training. Period!!! Teaching at Stage 7 is thematic, so, without rote repetition of exercises, students grapple with sets of ideas and problems over time. In addition, we take an unorthodox approach to ballet technique that allows students to apply its principles to whatever other forms of movement they want… jazz, musical theater, circus, modern, post-modern, etc. Strong basics plus versatility is empowering. While we do produce student performances such as in-house soirees and community festivals, we never dilute class time with rehearsals. A class is a class. Rehearsal is a rehearsal. I am most proud of the uniqueness and individuality of my students’ as they experience the power of their own dancing. On a broader cultural level, the “So You Think You Can Dance” phenomenon has infused our consciousness with an impression that dance is about of glamor, fame, and instant gratification or instant defeat. Since dance is a universal human phenomenon, our challenge is to stay grounded, real, and focus on the joy and power of dance for all. Follow this link to read the complete article. ART IS THE MOTHER OF ALL LITERACY. Is my art form a vehicle for communication? Does my art form support personal engagement and community participation? Does it distill my insights and synthesize my meanings? Do I use a symbol system that emerged to support my art form? Does my discipline support idiomatic expression for me and my community? Does my art form invite engagement and gain meaning from critical interpretation? Is it guided by particular structures, rules or agreed-upon [cultural] customs? Does my discipline adapt with relocation or change over time? Let us assume, for now, that the answers to the above are all yes! All of the above are characteristics of BOTH language and arts disciplines. Clearly academia generally privileges written and spoken language when it defines literacy. That forces all other ways of knowing through a single sieve: language. While trying to prove our relevance in schools today, might we have overlooked our gift to the future of education? Teaching Artists own the map to the Literacy Genome!! Each of our arts disciplines configures the guts of literacy in an unique way. (If this seems too radical a thought, go back and recheck the above list of the functions of literacy.) Our effectiveness as Teaching Artists stems from our ability to navigate the DNA of distinct literacies and engineer their relevance in school and community environments. In the future, the rules and frameworks that govern a single literacy will be too limiting to prepare children’s intellectual fluency for a world overrun by information. The arts, if well taught, offer engagement with an array of tools that build flexible, adaptive, and – most of all – creative citizens that are able to navigate a fast-changing world. We Teaching Artists “get” the DNA of literacy, whether we know it or not, and we model how its tools work. How can we get past rationalizing our relevance and set our sights on the gifts we offer the future? Part one: Create an exercise in which teachers and children (I insisted that they provide me with a 1:1 ratio of children to adults) collaborated in the choreographing of dances based on their shared interpretation of some favorite children’s books. In the first exercise they translated the written ideas into movement, and in the second they translated movement ideas into words. While I never rubbed their noses in the fact that this would never have worked if dance weren’t a literacy equal in stature to the English language, I know they left with a visceral sense that literacy was a broader subject than they came in with. Emphasize the fluid nature of responsibility for choreographic investigation between teacher and student. Learning and creating within this context gradually moves students away from dependence on teachers and toward artistic and technical independence. We engage with great choreographic works in order to apply movement concepts to a variety of contexts, and experience them directly and viscerally. Repertoire – study of classical, neo-classical, and contemporary works in order to apply ballet’s concepts artistically. Re-orientation of the sense of how joints and muscles operate in ballet-based movements that are practiced while laying on the floor. Excellent for recovery from injury and for test-driving advanced movements safely. Katherine Cordova approached a ballet barre for the first time when her younger daughter, an avid dancer, left home. œShe made me take a class to give me something to concentrate on when she left, Cordova says. Three years later, the lithe, energetic Cordova goes to five ballet classes a week. œI’m in better shape than I’ve ever been in, she says. Along with aesthetic rewards, adult ballet offers a range of fitness benefits, say Irey and other teachers who offer classes for adults. œA lot of students tell me it keeps their minds sharp, Wistrich adds. That goes along with recent research on the cognitive benefits of dance. 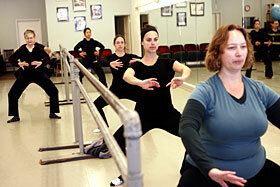 Absolute beginners: Adult ballet attracts many people who danced as children, but there’s plenty of room for neophytes. A number of studios offer pre-beginner classes, such as Irey’s œBonehead Ballet. Irey begins each Bonehead class by drawing students’ awareness to their wrists, for instance, or their upper backs. The idea is to œfind alienated body parts and to integrate the body as a whole. Belly up to the barre: Don’t worry that you’ll be expected to leap across the floor like Baryshnikov. Most of a beginning class is spent at the barre. œThat’s where the foundations for the center work are learned, Noblejas-Bartolomei says. The barre helps you balance as you shift your weight to one leg, freeing the other leg to trace a pattern on the floor or in the air. No tutus required: Ordinary workout clothes are fine, though you’ll want to wear something form-fitting, so the teacher can see what you’re doing. For footwear, Irey’s Bonehead class is done in socks the wilder, the better. Other classes request ballet slippers, available for $12 and up online; you may want to spend a little more at a dance store to assure the fit of your first pair.